Helen Gethsiyal daughter of Pastor.Anbu Selvan hails from Paramakudi in Ramanathapuram District. Helen is a very active and pretty girl. She is 12 years old. She loves music, dance, singing and food. She loves to play with her older brother Paul Onesiums. As a family they were looking forward to celebrate Christmas. But tragedy stuck the family couple of days before the celebration. 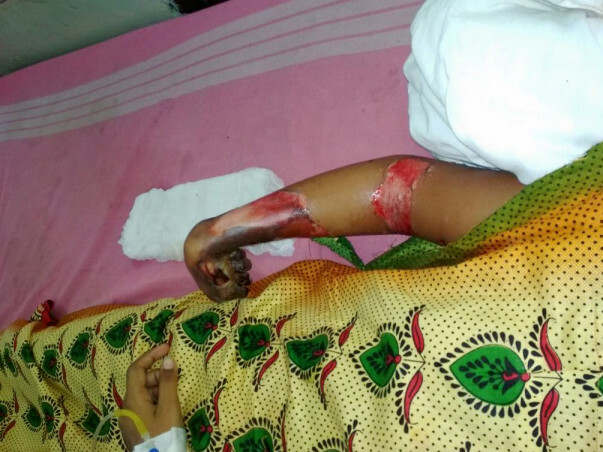 While Helen was playing on the top floor of her house unfortunately she touched a high voltage cable wire with a piece of wire she was playing with. She was electrocuted and lost her right hand and few toes. 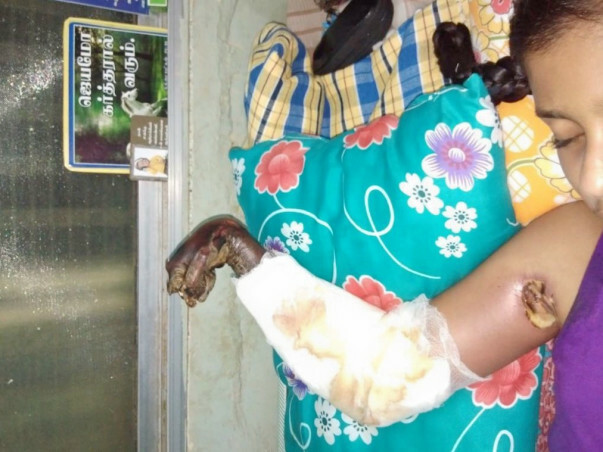 Her right hand was amputated along with few toes. 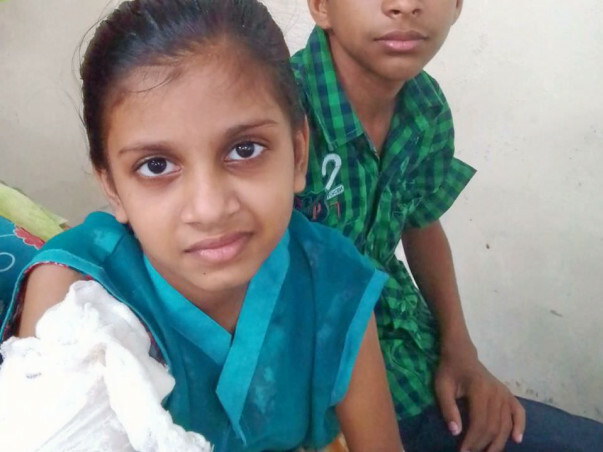 She is currently under medication in Madurai Goverment Hospital. I’ve already made a donation of Rs,45,000 towards her medical expenses. 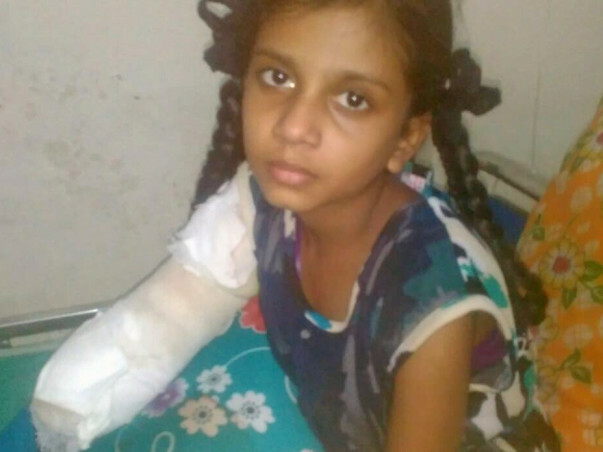 We could do with more finances to help her with her medical expenses and studies. As she has to learn to write with her left hand. Specially to get a prosthetic hand. I spoke with her last week. 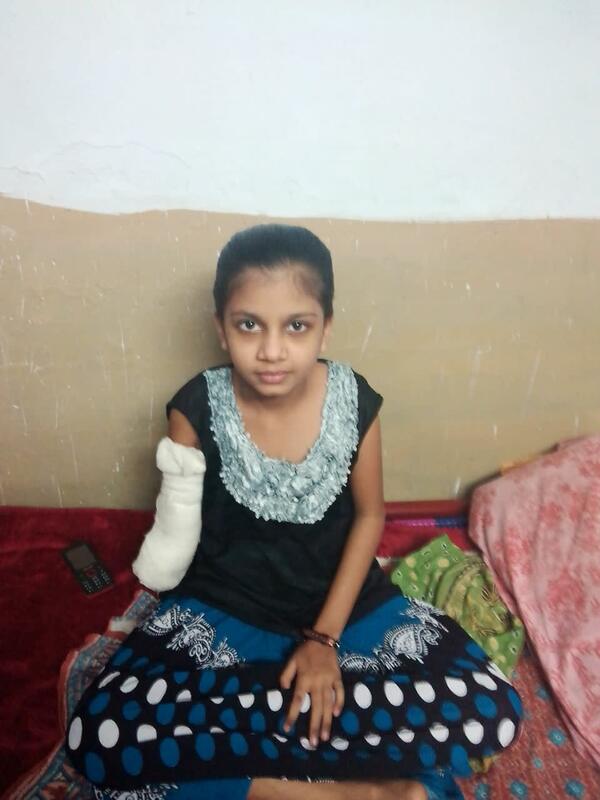 She is very brave girl, determined to learn and write with her left hand. 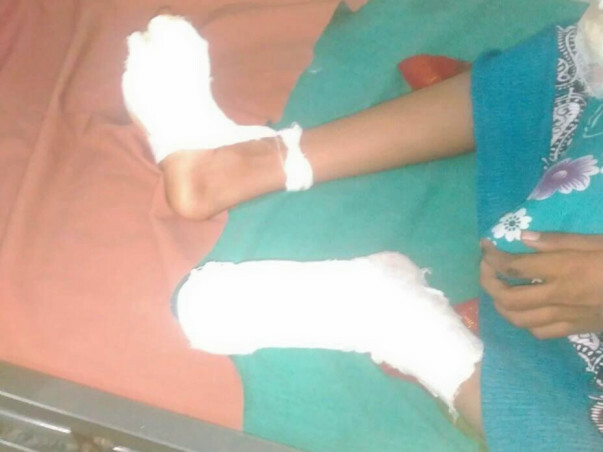 Though she is in a lot of pain she is looking forward to go back to school to meet her friends and to continue her studies. Thank you for the wonderful support that you have shown Helen. She is getting better. 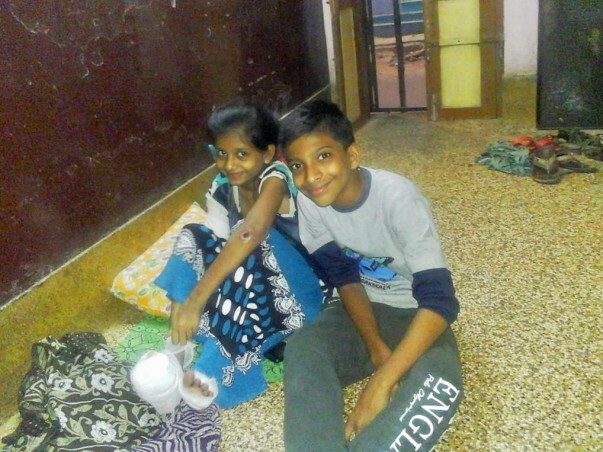 She lives with her grandparents in Madurai. This makes it easier for the family to visit the hospital for regular checkups. Last week she managed to get out of the house for the first time to be part of a Sunday service. She even performed a song during the service. Thank you once again for your generosity towards helping Helen. Please do pray for her health and speedy recovery. Will keep you posted. On ‪9/01/2018‬ I spoke with Helen and her father. I’m glad to hear from her father that she’s on the road to recovery. 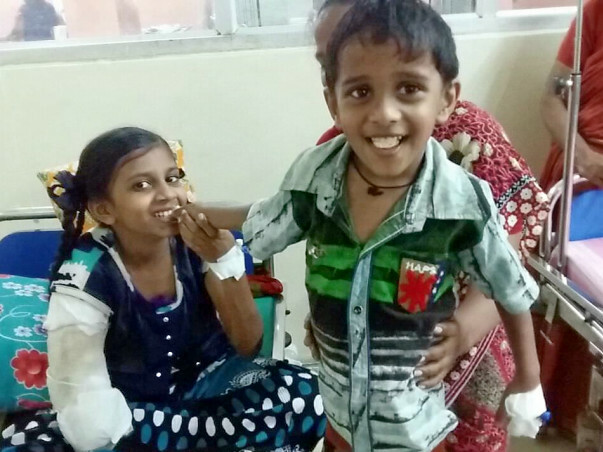 For the very first time since the surgery, the Doctors have cleaned her wounds without any sedation. The Doctors have suggested that she should stay in hospital for another 4 weeks, until her wounds are completely healed. Being in hospital will hopefully prevent her from getting any infection. She has made lots of friends in hospital, including Nurses, Doctors and other patients, who have been impressed by her character. 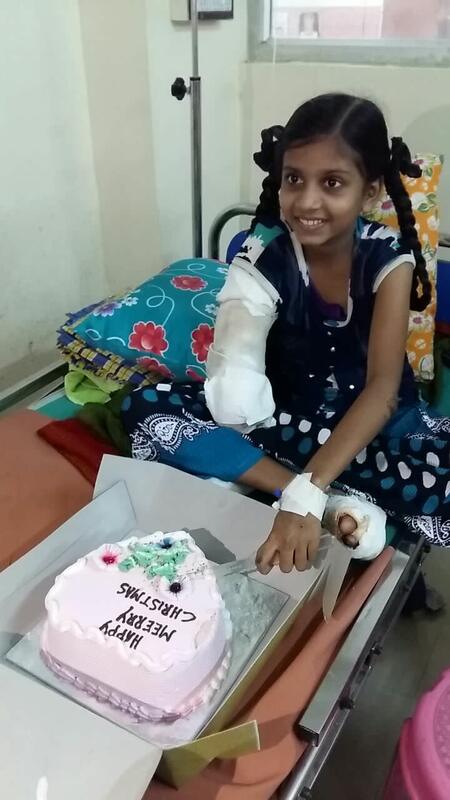 The Doctors and Nurses bought her a cake to celebrate at Christmas. Occasionally, she gets depressed when she thinks about her present situation. I’ve tried to encourage her and promised that we will stand with her and help her in any way possible, so that she can have a good future. I sincerely thank everyone who has financially support Helen so far, both online and offline, and also those who have promised to support her financially in the future. Please continue to share this situation with your friends and families to raise awareness. It is still possible to support Helen for her treatment. (Please reach out to me in case of any further queries by replying to this email).